His mother taught criminal justice and took her students to state prisons to help them better understand the culture behind bars. His father taught management. Villanova thought archaeology or anthropology might be his calling. That is, until he enrolled in a marketing class in high school. He became fascinated with consumer behavior – the psychology behind marketing that involves behavior and motivation. Now Villanova shares his fascination with students in his role as Walton College assistant professor, which he began in August 2018, with the Department of Marketing. He teaches both undergraduate and doctoral-level courses. His students have already made a favorable impression. “They actually are willing to come and meet you in your office, which I like,” Villanova says. My family consists of: my wife, Rhiannon, and mutt, Nala. If I could pick up a new skill in an instant, it would be: to speak Italian. The first thing I bought with my own money was: a toy recycling truck. My favorite breakfast cereal is: frosted shredded wheat. A food I cannot live without is: cheese. My friends would describe me as: punny. Villanova was born and raised in Boone, North Carolina, home to Appalachian State University, where his parents taught when he was a child. While in high school, he began working at a neighborhood grocery, which continued while he attended Appalachian State. His work experience was meaningful in many ways, he says. Most importantly, it was where he met Rhiannon, the woman who would become his wife. And while working helped with finances as he went to college, he began paying attention to merchandise on the store’s shelves. There were competing products. Price changes. Strategies. Shelf placements. Even today, as he shops, he says he studies how items are displayed and priced. When Villanova began interviewing with different universities, Walton’s faculty stood out from all the others, he says. For one, they asked questions about his research and seemed genuinely interested in him. He had never visited Arkansas and really didn’t know much about it except for it being the home state of former President Bill Clinton and the headquarters for Walmart. “It was definitely a fly-over state,” Villanova says. 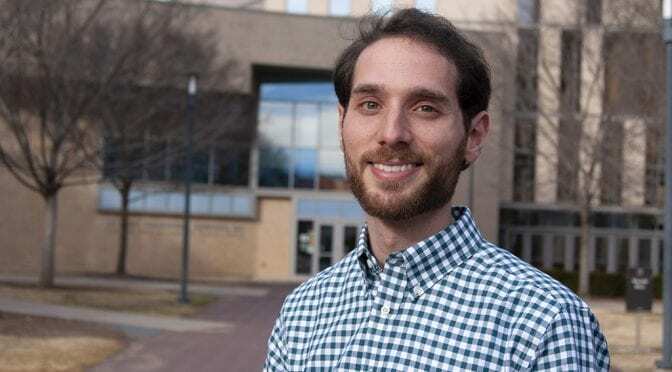 However, when he visited, he said the Ozarks reminded him a lot of Blacksburg, Virginia, home of Virginia Tech, where he earned his Ph.D.
Now that he’s settled in on campus, he finds that faculty ask something else: if he has any questions. He says he appreciates their proactive approach in helping him with his transition. Villanova has also made a discovery since arriving to Walton. When his mother was working toward her Ph.D. in sociology many years ago, she studied with Marketing Professor Jeff Murray when he attended Virginia Tech. Villanova didn’t know this until after the fall semester began, and it caught him by surprise. As for his own research, Villanova studies how consumers respond to numbers such as prices and product attributes. One way he does this is by looking at how special offers are framed. People may respond differently to a product if it is presented in pounds as opposed to ounces, or unit price as opposed to quantity, he says. Another way people respond to numbers is through product ratings. The frequency of ratings, along with distribution, can also have different effects on the consumer. There is more to product ratings than just the average rating, Villanova says. He also studies the “endowment effect,” which is the finding that people hold higher value to items merely because they own them. He says that for some owners, their possessions can feel like an extension of themselves. Villanova looks at different aspects of the endowment effect, such as what it would take for someone to sell something he or she owns, for example. Villanova and his wife are already sold on Northwest Arkansas, adding that they have only “scratched the surface” in exploring the area. That goes for Walton as well.